Things were tough 10,000,000 years ago. Ancestors is the first game from Panache, a Montreal-based developer co-founded by Assassin's Creed creator Patrice Désilets. It features a historical setting and climbing large, vertical environments, but the twist here is that the game is set 10,000,000 years in the distant past. You don't play an assassin: you play as an ape. And you aren't climbing buildings in ancient cities: you're climbing vast prehistoric trees stretching into the jungle canopy. "It all started from the need to build up a toolbox for a brand new studio," says Désilets, who worked on Prince of Persia: The Sands of Time and the first two Assassin's Creed games. "People say I'm the historical open world guy, right? But, really, what I do is create characters who interact with 3D worlds." "The Prince in Sands of Time, he runs on walls and swings. With Altaïr and Ezio from Assassin's Creed it's all about the climbing and interacting with large crowds. This is really the core of my craft, and for this new project I needed a character who could interact with a 3D world in an interesting way." One night, Désilets tells me, the idea to set a game in a prehistoric setting came to him in a flash. "This would be easier for the new studio, because we wouldn't have to build a city or a society, or have the player interact with technology," he explains. "It would just be this character in a primitive, organic environment. But we soon realised that organic isn't easy at all." Ancestors is a third-person survival game set in an open world. You begin as a relatively primitive ape, but over the course of the game you evolve: figuring out how to use tools or build a place to sleep. As you play, neurons are fired in your ape's brain, which acts like an upgrade tree. And you learn by doing: developing new social skills by interacting with other apes, or new motor skills by picking up and experimenting with objects such as sticks, rocks, and plants. When I first climbed a tree and found a coconut, I couldn't do anything with it. My ape just stared dumbly at the thing. But then, later, when I developed the ability to use both hands, I was able to pick up the coconut in one hand, and a rock in the other, and smash it open. When I figured this out I felt like that ape from the beginning of 2001: A Space Odyssey when he figured out how to use a bone as a club. I could almost hear Strauss playing. It felt great. "I was bored of the whole 10,000 BC thing," says Désilets. "People going around in animal skins and swinging clubs. So I looked back further, to 10,000,000 years in the past. Let's be that ape in the tree who came down and stood up. That's a pretty cool fantasy, right? We still have this instinct buried in the back of our minds, even as modern humans, so why not play it?" "I read books on paleoanthropology. 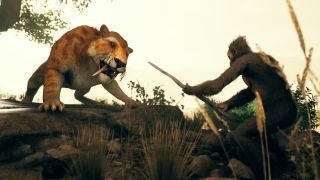 I was following the timeline and the science, about how we became bipedal, and we designed the game around that journey. Originally it was episodic because I didn't have a lot of money, so it would have to be a shorter game. But then Private Division came in and said forget that, we'll give you enough money to make the game you want." I spent a lot of my hands-on time with Ancestors feeling confused, like I was fumbling around in a dark room for a light switch. The game is reluctant to telegraph how any of its systems work. But this is, as far as I can tell, by design. It's seemingly opaque on purpose, forcing you to use your instincts to figure things out. I like this in theory, but I think it could do with a little more in the way of hints about how exactly things work, just to ease new players in. Admittedly, when I did figure something out myself, the satisfaction was pretty immense. When I speared my first fish in a river with a pointy stick I felt like the smartest ape who ever lived. And when you achieve something like this, it contributes to your evolution via a scoring system, and you can try and advance to the next evolutionary epoch at any time—although you'll be held back for any mistakes you make. I fell off a cliff while trying to scoop honey out of a beehive, and I think that set my evolution back quite a bit. "You decide how you want to evolve and how fast," says Désilets. "It's a game full of systems that talk to each other, and you create your own experiences through those systems. Even if you can see the Matrix like I do when I play every day, unexpected things can still happen. This big ape is inside you. It's all there! Somehow, we are ready to survive in the jungle. It'll be tough, but it's in us. In the first prototype the game was more explicit about telling you what to do, but now you have to figure stuff out by yourself. And when you do, it's an epiphany moment. "Our job as game makers is to ensure anything a player thinks, or any idea they come up with, is accommodated. But we're walking a line. Are we saying too little? At this stage it needs refinement, but it's a conscious decision for people playing this game to rely on their instincts. Some players probably will bounce off it, but I'm not worried about that. Some people don't like The Beatles, you know? When it comes to creative projects you can't please everyone." I ask Désilets if making a unique, strange game like this is easier now than it was back when he worked on the first Assassin's Creed. "I don't need to sell 25 million copies to make a buck," he says. "That helps! But people tend to forget that the first Assassin's Creed was pretty out there too. I mean, I made a game about the Crusades, politics, religion, and one that was also set in the future and was a science fiction story. Even with Sands of Time, Ubisoft had us in a small booth to the side at E3. They were like: what the hell is this game?" "I'm not a good game designer," he continues. "I do my thing, and it takes a while for it to make sense. In AC1 you sit on benches and you walk in crowds. It's not a game about running around killing people with blades. There's some really intense dialogue in there. People tell me it taught them things about life. Last year a game designer told me that Assassin's Creed inspired him to get into the industry, and he described it as a Trojan horse, and he was totally right." "You have the word assassin in the title, but people forget the creed part. Players come in thinking, cool, I'm gonna be an assassin! Then they realise that it's a bit deeper than that. We trick them. And it's the same with Ancestors, really. We're still those big apes deep down, but now we're in a controlled environment. Biologically we're wired to survive a harsh environment, but now that doesn't really exist. So we invent a harsh environment." "There are no leopards running around. But we have anxiety and we have this [points to his stomach] because when we get some sugar, our brain tells us we need more, because you never know when you won't have it. That's the primitive brain at work. We don't have to hunt, we just go to the grocery store, and that's not good for us, man! It's not all about these deep themes, though. Above all, playing as an ape is just a fun experience. But they're definitely in there." Ancestors isn't out till later this year, and it still has a way to go in terms of polish and communicating its systems. I also found the climbing a little frustrating, especially when I'd fall to the ground, break my legs, and have to limp around or sleep until they healed. But I can't fault its imagination, and I've never played anything like it. Désilets is wildly passionate about the project and I think with some refinement, it could be pretty special.